Since the early 1960s the sight and sound of the class 47 diesel locomotives have been a major feature of the UK motive power scene. Now you can take the opportunity to relive the classic time period when The Class 47s ruled the railway. 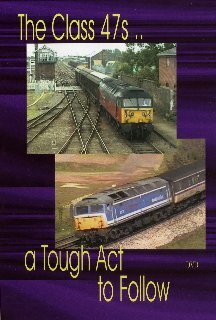 Our DVD “A Tough Act to Follow” is a truly enjoyable viewing for all Class 47 fans, featuring approximately 68 minutes of non-stop Class 47 diesel locomotive action throughout 10 glorious years from 1989 to 1999. Take time to marvel at the scenic locations, the liveries and immerse yourself in the sounds of these fine locos. It is truly amazing to see and visually experience the variety of duties that these locomotive workhorses undertook. Therefore, this DVD maintains the historic preservation of these splendid diesels because with the influx of foreign built locomotives their reign is nearing its end. Produced in full colour with captions including locomotives, locations visited and specific train details. Used on both passenger and freight trains on BR for over 50 years! Produced by GLOBE VIDEO FILMS and released October 1999.